Through a serial of news and articles released in the last few weeks, analysts may have already know some advantages of esProc, including ease of use, friendly interface, strong computing ability etc. Besides the previously introduced highlights, the core of script computing should not be neglected. esProc, the desktop BI software is high capable script for business statistical computing. Different from some other script applications, esProc delivers more advances. The script codes of esProc are easy to learn and use since they are short but understandable. 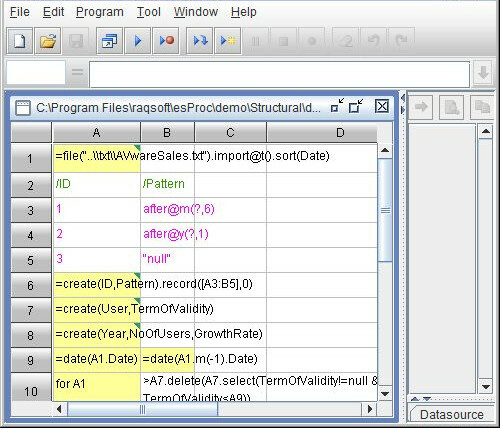 Some of its script computation capabilities are similar to SQL, but they are much easier to use for analysts without very high SQL expertise or programming knowledge. With agile script language, analysts can make statistical computation independently at their will. Besides, the script computing in esProc doesn’t need pre-modeling, while solve complex problems step by step. With “.” for object reference, the script codes in esProc-the desktop BI tool, are easier to write and understand. The complex and lengthy association script codes of SQL thus can be converted to simple object access. The repetitive computations are avoided as well. The step by step script computation and object reference also visualize the relationship of each step. Visualized script computation and analysis procedure conform to human brain thinking, bringing work efficiency to analysts. In addition, esProc, the desktop BI software can integrate complex and various datasource like Excel, txt, database, etc. through JDBC interface as a database, thus farewell complex SQL and stored procedure, which is also an ideal tool for reporting.